NOTE: This review contains minor spoilers, but nothing beyond the trailer. Though largely known as screenwriter for Martin Scorsese's Taxi Driver, Raging Bull, The Last Temptation of Christ, and the underrated Bringing Out the Dead, Paul Schrader has spent much of his career directing as well. 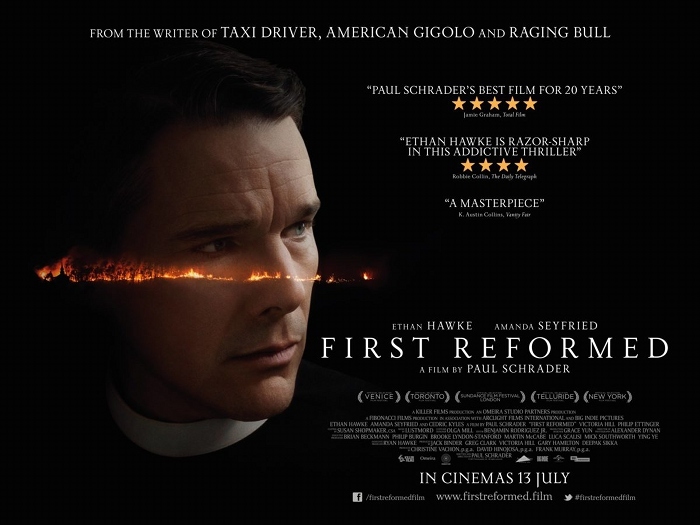 Films live Auto Focus and Light Sleeper also follow lonely, self-destructive men on their slow paths to redemption and/or failure, so it comes as no surprise that Schrader's latest film First Reformed (2017) keeps this tradition alive. Our story follows Ethan Hawke as Reverend Ernst Toller, leader of a dwindling historic New York church that's set to celebrate its 250th anniversary in the coming weeks. The unexpected death of Toller's son Joseph in Iraq led to his divorce, so he's spent the last few years wallowing alone in despair and self-pity. Recently, the troubled reverend has been maintaining a detailed handwritten journal, determined not to censor his thoughts or tear out any pages for an entire year. Toller is approached one morning by young, pregnant wife Mary (Amanda Seyfried), who's quite clearly concerned about her husband Michael's recent behavior. It's not long before Toller becomes fully ensnared in a potentially horrific situation: Michael (Philip Ettinger) is an environmental activist who doesn't want to bring a child into the world, while Mary's discovery of a suicide vest has only cemented her suspicions. Michael's reservations about God's forgiveness and humanity's uncertain future have only made his outlook worse, but he reluctantly agrees to meet Toller for counseling. In Michael, the reverend sees an opportunity to save the son he couldn't, but at this point Toller's attempts to reach him might be in vain. The film's slow, somber pace is anchored by a curious set of visual restrictions put in place by the director. 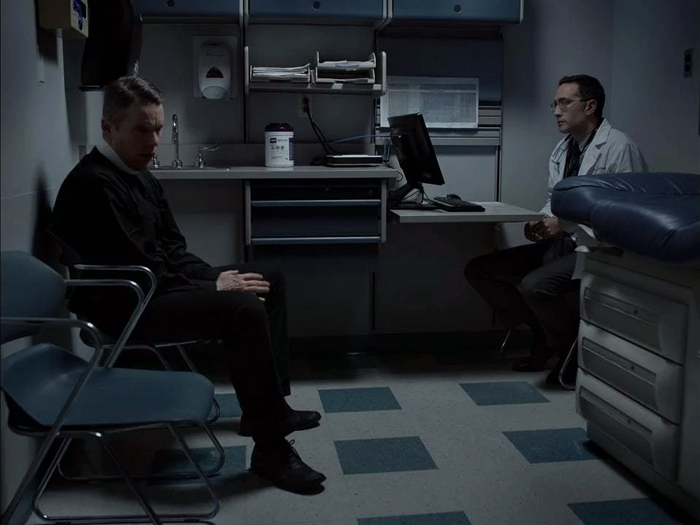 Framed tightly at a non-traditional 1.37:1 aspect ratio, First Reformed is carefully composed and often uses close-ups in conversation rather than over-the-shoulder shots. Subjects leave the frame empty before cuts are made, while the camera barely even moves at all -- there are no pans or tilts, just two dolly moves and one slow zoom that's an obvious nod to Taxi Driver. What's more is that many interior details (furniture, signs, pictures) were omitted entirely or digitally manipulated, creating an incredibly sparse and uncluttered atmosphere. 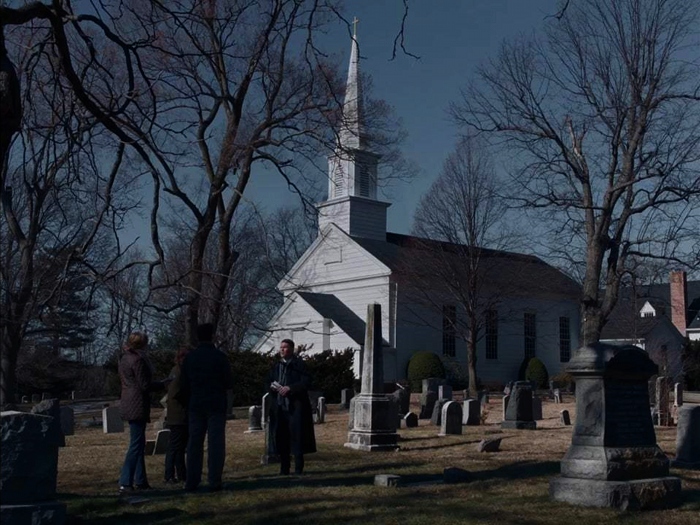 In his accompanying audio commentary, Schrader describes a desire to focus our attention on First Reformed's characters and story, rather than distracting us with background items. Need more proof? First Reformed lacks a traditional score as well. Though a few diegetic pieces are used during its first half, more than an hour goes by before any sort of background "music" is utilized. These low, ambient tones were created by Welsh industrial musician Lustmord -- he's collaborated with the likes of Tool, Puscifer, and The Melvins, worked as an "additional composer" on films like The Crow and Underworld, and released roughly three dozen albums since 1981. It's not far off what you might hear from Atticus Ross and Trent Reznor in their scores for David Fincher, though in a more understated fashion. These bursts of cold, unsettling sonic ambiance heighten the dread and tension during the bulk of First Reformed's most emotionally brutal moments, even though some of its unforgettable visuals barely need that extra punch. There aren't many warm, inviting pipe organs here, and First Reformed is all the better for it. Together, these careful restrictions create a true "lean-in" experience; one in which new viewers are forced to pay close attention and, most importantly, draw their own conclusions. The final sequence, though open-ended at first glance, offers the most obvious example of this: it's clearly more idealized than realistic, yet we're still left hanging by a thread and never get the full satisfaction of knowing if what we're seeing is actually taking place. (Schrader describes it as "one of two happy endings", which might be one of the most cynical things I've ever heard.) Whether or not you appreciate the ending or are ready to travel down First Reformed's dark path in the first place, Lionsgate's new Blu-ray offers a quality A/V presentation and a few thoughtful bonus features that give viewers a welcome glance behind the curtain. Presented in its original 1.37:1 aspect ratio, First Reformed looks as good as expected on this new 1080p transfer from Lionsgate. The film is primarily lit naturally, with dark interiors and overcast skies creating a suitably subdued atmosphere. As there isn't a great deal of action here (from characters or the camera), we're left with a strong and stable image that doesn't suffer from ghosting, compression artifacts, or other imperfections. Black levels and contrast are quite good at times, with natural skin tones and a solid amount of depth. Overall, it's a great-looking image that presents the film in its best possible light. Similarly, the DTS-HD 5.1 Master Audio mix doesn't offer a showy presentation but gets the job done nicely. The bulk of First Reformed is right up front with clear dialogue and occasional front channel separation, with occasional bursts of low end activity when its largely ambient "score" kicks in. As with the video, this is a purposefully stark presentation that isn't meat to divert attention from the characters or story. Optional English (SDH) and Spanish subtitles have been included during the main feature only. Lionsgate's standard interface features a handful of forced trailers, simple but rather sluggish navigation, and a "Resume" function so you'll only have to put up with it occasionally. This one-disc release is packaged in an eco-friendly keepcase with a matching slipcover and a Digital Copy redemption slip. 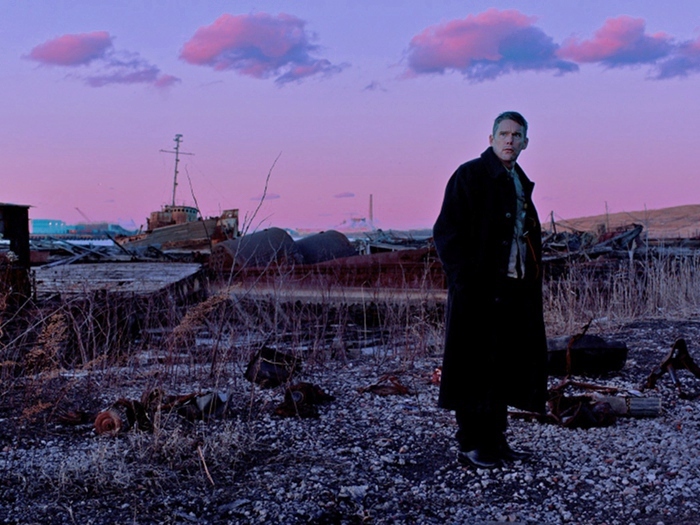 Paul Schrader's First Reformed is a jagged, volatile film about two or more touchy subjects, and one of the most fully-realized of his career. It offers a dark story anchored by outstanding performances -- not just Ethan Hawke, even though he's featured in almost every scene -- that uses deliberate restrictions to draw in unsuspecting audiences without leading them around by the nose. No matter what you're expecting out of this one, chances are you'll be blindsided at least once before the credits roll. Lionsgate's Blu-ray offers an immersive A/V presentation and a small but valuable collection of bonus features that fit like a glove. First Reformed comes firmly Recommended, although new viewers may want to rent it first.